United Specialty Alloys offers Oxy Fuel Cutting services that will help you save time and money on your project. We have the steel and will cut just what you need without all the left over waste. Just buying what you need will save you money and time! United Specialty Alloys has the experience and know how to get you just what you need. That is a part of what we do for our customers every day. 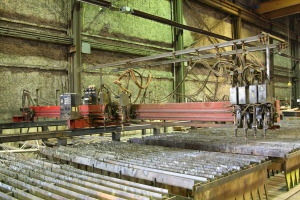 The key to cutting thick plates is reaching higher temperatures, which is something that United Specialty Alloys is equipped to do if your project requires it. With experienced professionals making up our team and high quality equipment, we are ready to tackle your Oxy Fuel Cutting needs. Did you know that this process is more than a century old? The good news is that it is still an efficient method and we employ the latest innovations in this industry, using a combination of fuel gases and oxygen to execute your Oxy Fuel Cutting projects. While a torch provides the initial heat for kindling the cutting process, a flow of oxygen helps to efficiently and accurately complete the cutting process. This time-tested process has been perfected since its first uses in the early 1900s, and it’s something United Specialty Alloys is proud to offer customers for their projects. Our facility includes an 8′ x 20′ Oxy Fuel Burning Table, a 12′ x 45′ Oxy Fuel Burning Table, a 10′ x 40′ CNC high definition plasma/Oxy Fuel Burning Table, 8′ x 20′ water table with for underwater plasma cutting, and a 72″ x 144″ CNC high definition plasma machine with true hole technology.